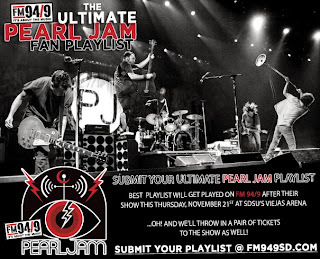 FM 94/9 celebrates the return of Pearl Jam to SDSU's Viejas Arena with a complete takeover of the radio station! Sets of Pearl Jam songs are being played every hour, FM 94/9 listener Coury Miller's Ultimate Pearl Jam 10 song Playlist will be played on air after the concert ends, and a complete web and social media takeover is in full effect today as FM 94/9 pays homage to one of the most important bands of the past two decades. Tune in!